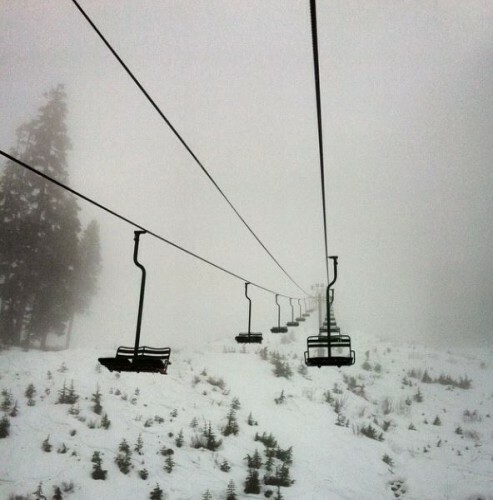 The entire west coast is having a very tough ski season. Total precipitation has been close to normal but we’ve had above average temperatures all winter. The meteorological features that are freezing the east coast are baking the west coast. The last couple years my plan has been to just pick a couple great ski days instead of going more often throughout the winter. Finally I decided that if I was going to wait for that to happen this year, I probably wouldn’t go at all. So last week I took a day off in the middle of the week and headed to Crystal to survey the carnage. The first thing I noticed was that there was almost no one on the road with me. Even for a midweek ski day, the road is usually a line of cars in a long parade to the mountain. This time I only saw one other car. I arrived at the parking lot 10 minutes before the lifts opened and easily parked right in the front lot which I have NEVER done before even when arriving an hour before the lifts opened. The base area had more grass than snow and the ride up the gondola didn’t change that much until we hit about 5500-6000 feet. However, once we got to the top, the coverage was actually pretty good, or at least it was better than I was expecting. Once the snow softened up, you could venture off the groomed trails if you took some care. Rock skis are a must as it’s nearly impossible to ski to the bottom of the runs without dodging rocks and there are places where you have a to carefully follow a path of snow that is just a few feet wide. Nobody is allowed (or able) to ski to the bottom of the mountain. You have to download on the gondola. Only the lifts on the top half of the mountain are open. It’s not a pretty situation but everyone I rode the lift with was having a good time and enjoying it for what it was. The skies were perfectly clear and the views were amazing. 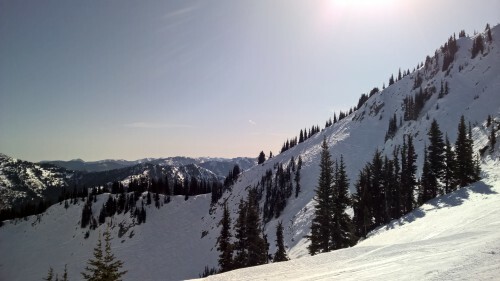 It was worth the lift ticket just to remember how incredible the mountains look on a day like that. Sure, this isn’t a normal year, but there’s still plenty of fun to be had. You just have to go with the right mindset. Last year was a huge change for me as I dropped from 15-25 ski days per year to just one. This year I had hoped to get out at least two or three times, but I’m wondering if that will happen. This year has been a horrible snow season and the resorts are still barely open. If you go, be prepared to dodge a lot of rocks and bare spots. This is what skiing is normally like in November if they open early, not in late January in what is normally the height of the ski season. How bad is it? Here are a photos from Baker, Alpental and Crystal, respectively. Lots and lots of rocks and trees poking through. If you stay on the groomed runs, you might have some luck, but even then, it’s usually either icy or soupy. There’s just no new snow to make things nice. Stevens seems to be doing the best but even that is pretty tough. Anything off the groomers is not really an option. Here’s a shot from the back side and that doesn’t look like nearly as much fun as usual. This doesn’t meant that every single day has been worthless. If you go with the right attitude, choose your day somewhat carefully, and have a good group of friends with you, there is fun to be had. Personally I know I only get a couple days a season now so I’m waiting for a day that will really be worth it. So far there hasn’t been anything close. After a very dry start to the winter, February was one of the snowiest Februarys on record. Then, in the first week of March, we got more rain than we normally get in the entire month of March. Contrary to popular belief, rain doesn’t do much to melt snow. It takes almost an inch of rain at 40 degrees to melt an inch of snow. Most of the water goes into consolidating the snowpack and greatly increases it’s overall weight. So after all that rain, we had a huge amount of new, heavy snow on top of a sheet of ice from the limited snow we had in the first part of the season. The avalanche danger was extreme. The ski patrollers at Crystal are always setting off bombs to create controlled avalanches. They regularly bomb inside the ski area, but for areas that see lots of skiing, it’s pretty rare to have a big slide. 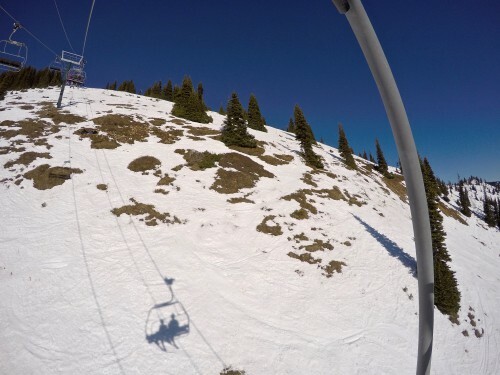 The skiers compact the snow and increase the stability of the snowpack. But this time was different. 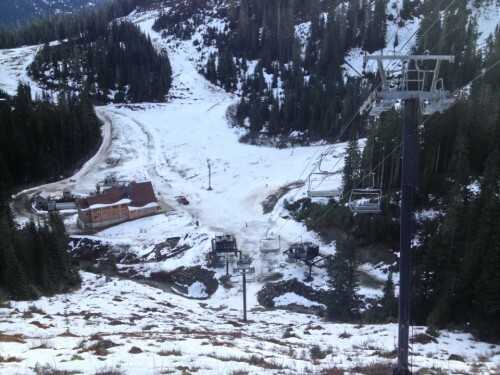 On Monday after the ski area closed, the patrollers set off a charge that triggered an enormous slide which ended up taking out the base of the High Campbell chair lift. This chair has been a source of frustration (and fun) for skiers for years and was scheduled for replacement in the next five years. Those plans have now been accelerated. 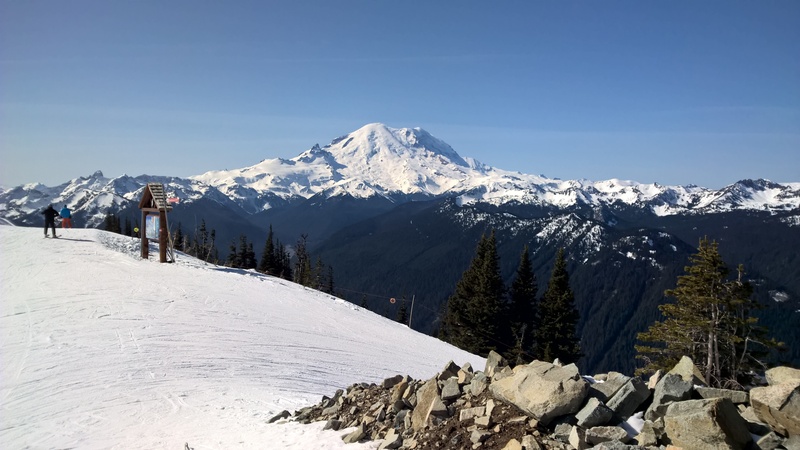 One of the owners was in the ski patrol group that set off the charge and you can read her account on KUOW and an even better account on the ski patrol blog. There is also a good video on Vimeo showing the carnage, but it doesn’t show the actual slide itself. I don’t think anybody got video of that since they were all hunkered down in safe positions. It sounds like they’ll be auctioning the chairs off for charity but it will take them a while to get that settled out. I already have one of the Mt. Baker chairs in the backyard. I wonder if I can convince Tyla that we need another one? This has been a very bad year for skiing in the Pacific Northwest. The bad weather, combined with my lack of free time, means that I haven’t had any days on the slopes yet. That all changed about a week and a half ago when a series for storms started hammering the mountains. They were receiving about a foot a day every day. On Sunday night, Crystal received two feet. Then on Monday they had to stay closed all day because of a power outage. On Monday they got another foot and a half leaving 3.5 feet of untouched snow and 66” in four days. I took Tuesday off and headed for Crystal. This ski trip was a lot different than last year given that we have a baby at home now. Also, Tyla wasn’t feeling well so I wasn’t sure I could even go. The night before, I decided to relax and just take it as it comes. I wouldn’t worry about getting first chair, planning an attack on the mountain or anything like that. It’s a good thing I took that approach. First I left the house about 20 minutes late as I took some extra time to make sure Tyla and Elijah were off to a good start with their day. Traffic and slow drivers in the snow added another 40 minutes to the normal trip time. That meant I hit the Crystal parking lot at 9am (when the lifts open) instead of the 8am I had planned. Once I got up to the ticket counter, I discovered that their online system for buying tickets had been offline so the normally short lines were HUGE. It took 30 minutes to get a lift ticket. Oh how I missed my season pass from last year! Only Chinook Express and Forrest Queen were running while ski patrol detonated lots of avalanche bombs to make the shaky snow pack safer. 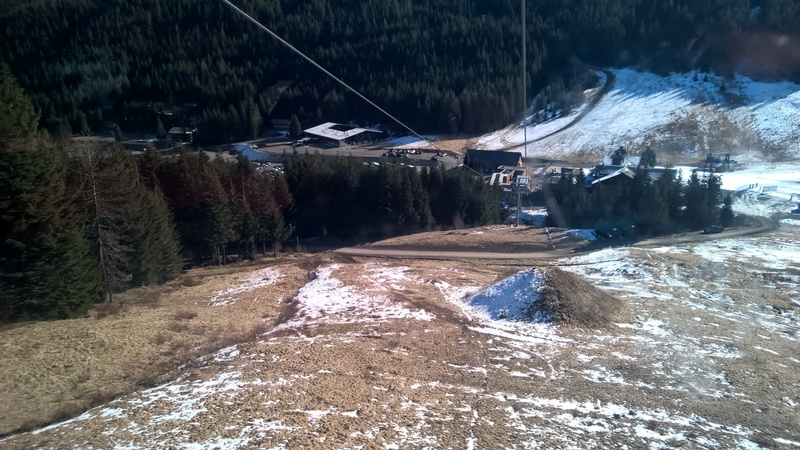 I took some easy runs while I waited for more interesting lifts to open. The lines were enormous as all of the powder hungry skiers and kids on mid-winter break crammed on to the two lifts. Rainier Express finally opened and, after a 30 minute wait in line, I made it to the top. Down below, the snow was falling very fast (1-2” per hour according to the telemetry), and up top it was WINDY. The sensors were showing 30 mile an hour average winds with gusts well over 50mph. Throw in the very thick cloud layer and it was almost impossible to see up there. Now add in that 3-5 feet of fresh snow and wow, it was a crazy situation. These are the types of days where you really do need a partner to stay safe up there. It’s so easy to fall into a tree well or get stuck somewhere. It was so bad that I actually called it quits for the day. Even though I had only been there a few hours, I got stuck in the parking lot trying to leave. Thankfully I had remembered my shovel and was able to dig myself out and get traction with some old t-shirts in front of the tires. It sounds crazy, but apparently you can have too much snow… or maybe I’m just getting soft in my old age. UPDATE: I wrote this on Tuesday after I got home. 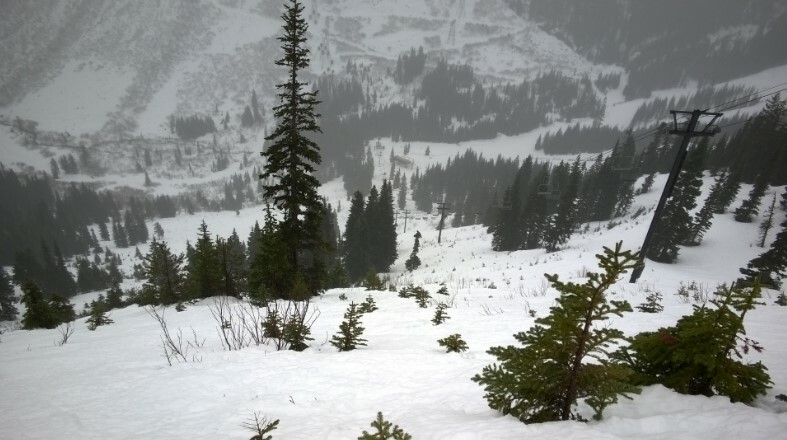 Later, I learned that a skier died on Monday at Stevens Pass (hit his head on a rock) and a skier died at Crystal on Wednesday (stuck in a treewell and his buddy couldn’t reach him in time.) Couple that with numerous in-bounds avalanches triggered by ski patrol with explosives and I think it validates my decision to come home early. The mountains are no joke. If you want the ultimate ski goggle, your search starts and ends with the Oakley Airwave 1.5 ski goggles. Oakley took one of the top ski goggle lines in the world and added Wi-Fi, GPS, Bluetooth, and a bunch of sensors which all feed to a heads up display inside the goggles. Version 1 was introduced last fall and this year they’ve included some upgrades like an upgraded graphics processor and better battery life. So what can you do with all this tech strapped onto your face? These goggles will track your speed, airtime in jumps, total vertical feet skied, and show you where your friends are (if they’re using the goggles too or running an app on their phones). All of this is presented via the heads up display. The goggles can also connect to your smartphone to control your music, receive text messages, and a lot more. As you probably guessed, these aren’t cheap. MSRP is $650, but when you consider that the Google Glass beta kits are going for $1500, this is a steal. It all sounds pretty incredible, but you have to wonder how it works in real life. Is it safe to have a display like that always at the ready even as you’re skiing down the hill? Oakley has offered to let me demo these later in the year so I can give you a firsthand review! We’ve tentatively agreed on a January test so stay tuned.